grandma's cookie jar: crafting with grandma - Polka Dot Animals . . . & Creatures! crafting with grandma - Polka Dot Animals . . . & Creatures! 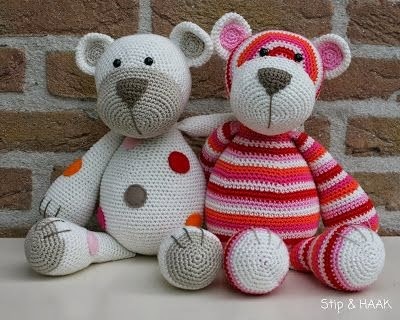 for crocheted polka dot bears on Pinterest, too! This bear is sooo cute and would make a great gift for Valentine's Day for grandchildren . . . if you hurry . . . or for a birthday, Children's Day (the second Sunday in June) or just for fun! Follow this link for a look at several fun polka dot animals . . . I like the bears and sheep the best! I didn't see a pattern, but think it would be pretty simple to make an animal and cover it with dots . . . or maybe a monster or alien and add the dots as well! What do you think? If you made a polka dot animal or creature, what would you make?